Some campers might be hard-pressed when thinking about camping with a loved one and sharing the same sleeping bag as well as the same tent. This is actually a great way to be romantic with your partner and to show them the outdoors if they are not quite such an avid enthusiast as you see yourself to be. The best double sleeping bag is a great way to get them out of the house and still have them close to you at night for extra warmth in the colder winter regions. We have decided to look a little deeper into double sleeping bags to show you exactly what you should look for when you want to buy one and we have also chosen a few of our own that we would highly recommend as the best double sleeping bag for backpacking or camping. 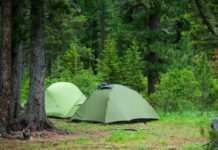 The warmth rating or ﻿R-value is important when considering most outdoor sleeping items and having the right one for the destination you are traveling will make all the difference. A higher R-value means that the sleeping bag can withstand colder temperatures and keep you warmer for longer, but it is also more expensive. Sleeping bags are available in down and synthetic materials and choosing the right one is essential. If you continue reading, you will notice that we have decided to look a little deeper at the key differences between down and synthetic in sleeping bags. The zippers are heavily related to comfort and you will need to choose between having two zippers or having one zipper. Having a zipper on each side is recommended as this will make life much more comfortable if one of you should decide to get up during the night without disturbing the other one. Outdoor equipment and waterproof capabilities are closely related and it is very beneficial to have a waterproof sleeping bag. Sometimes the water might seep through from underneath the tent and if the sleeping bag is not waterproof you will have a hard time keeping it dry. Most of our body heat is lost through our heads and having a hood is a good way to ensure that the heat does not escape. Many sleeping bags will have detachable hoods that can be easily removed, but we highly recommend that you consider having a hood included in the sleeping bag to keep the heat on the inside. Double sleeping bags are much larger than standard sleeping bags and they are only available in the rectangular shape. Choosing the right size for you and your loved one will ensure that you can enjoy the night in absolute comfort. These 6 features are considered to be fundamentally important when you are looking for a decent sleeping bag for backpacking or camping and having them in your double sleeping bag will definitely improve life and make the sleeping bag much more comfortable. Depending on how many of these features you have included will dictate the price as well. Many people and especially outdoor newbies are generally stumped when they have to make this decision and without the right knowledge, you will find it hard to choose between synthetic and down. We have decided to educate you on all the intricacies surrounding these two fillings and how they differ from one another. Down is generally made from goose or duck feathers and it is also the more expensive option between the 2. Down fillings are great for keeping you warm and insulated in the colder parts of the world and the filling will also stay lofted for much longer. Down is the best option if you plan on having cold outdoor trips, but it does lack in terms of being water resistant. Nowadays, down is treated with DWR to ensure that water cannot penetrate. Synthetic is the cheaper option to go for and it is also the most common option for campers. Synthetic might not keep you are warm as down, but it will definitely keep you dry. Synthetic materials are a little lighter than down, but they cannot be folded as compact as down to make them ideal for backpacking. 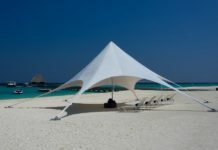 We recommend synthetic sleeping bags for those constricted to a tight budget and for those camping in the warmer, more tropical regions of the world. You should look at some of the other unique features that these fillings will offer you. 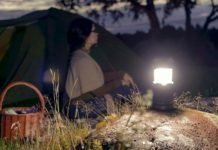 Down is by far the best investment to make for all camping and backpacking purposes. Finding a good double sleeping bag for backpacking can be quite a daunting prospect and many people are quite hesitant due to the added weight and size. The double sleeping bag for backpacking from Sleepingo is constructed with a synthetic filling and it only weighs in a 3 pounds. This makes it one of the lightest double sleeping bags on the market. The sleeping bag also has quite an impressive size at 87 x 59 inches and will definitely be ideal for any couple use to sleeping on a queen sized bed. 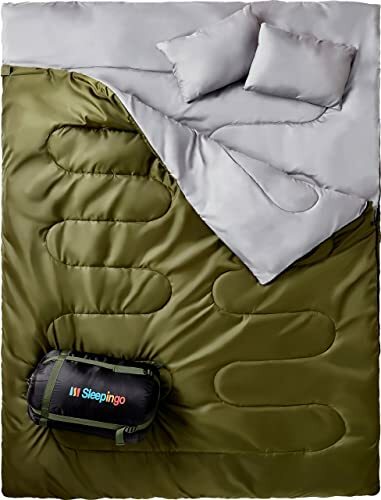 The sleeping bag also contains a sleeve for a sleeping pad and if you decide to invest in one of these, you will be sleeping much more comfortably and a little elevated of the ground. In terms of pricing, this sleeping bag is not that expensive and will be a good long-term investment for tropical camping and backpacking. The only real problem we have found with the sleeping bag is the ability to keep you warm in extremely cold temperatures. We highly recommend this sleeping bag for backpacking due to the lightweight. Teton is a very highly regarded outdoor brand and their products are tested very thoroughly to ensure good quality. This is no different with the Sports Mammoth Queen Size Sleeping Bag, which has been constructed with a synthetic filling. The size of this sleeping bag is immense and it will expand into a size of 94 x 62 inches, this is much larger than a queen-sized bed and if you have a decent sleeping pad, you will be sleeping an absolute comfort. The sleeping bag features an extremely durable Taffeta lining that will withstand even the most rugged of terrains and the inner brushed flannel lining will allow you to sleep like royalty in comfort and luxury. Unfortunately, the sleeping bag can only withstand temperatures of 32 degrees Fahrenheit and this might not be enough for the colder conditions that you could find in the North. We highly recommend this sleeping bag, but it is quite expensive and there are a few cheaper options available. In terms of durability, this sleeping bag will excel and you will definitely be making a good choice if you decided to invest in a Teton product. The limited lifetime warranty will keep you protected as well. Constructed from 100% polyester, the Grizzly by Black Pine 2-person sleeping bag is designed with comfort and durability in mind. The sleeping bag is available in both down and synthetic and the down is recommended for temperatures below 10 degrees Fahrenheit, but it is also expensive. The sleeping bag is also quite large in terms of size and it is 90 x 65 inches, which is almost the size of a king sized bed. Microfiber insulation is added to the sleeping bag to ensure that you can stay warm as much as possible and the ripstop polyester will ensure good durability. The added flannel lining will ensure that you have a comfortable texture to sleep on, but the sleeping bag is missing a hood to keep you warm and prevent heat from escaping. The sleeping bag is rather expensive, no matter which one you choose. We do highly recommend it due to the fact that it is designed to keep you warm in cold temperature. The down version will be the best for extreme temperatures. The Sportneer – 18C/0F sleeping bag is probably one of the best that you could choose for cold temperatures if you are strapped to a budget. 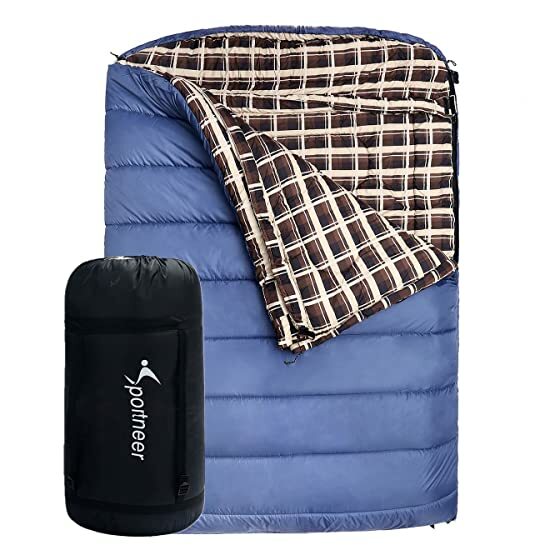 The sleeping bag is constructed with a fiber insulation filling and this will keep you warm in the coldest of temperatures and even at 0 degrees Fahrenheit. 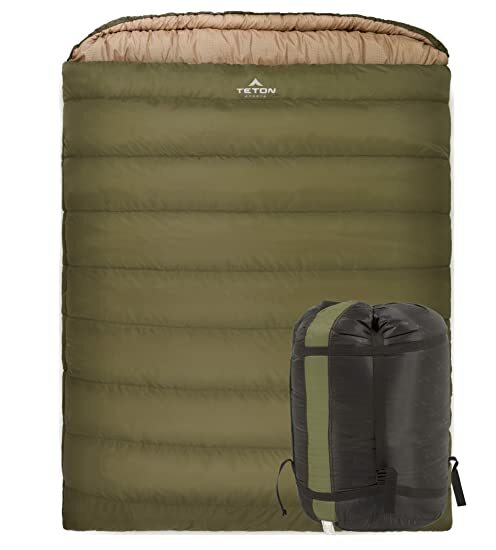 The bag is also quite large at 90 x 62 inches and the inclusion of the Taffeta lining will definitely improve the durability to such an extent that you can use the sleeping bag in almost any rugged or extreme terrain. The sleeping bag is also waterproof and you will not have to deal with a soaking bag that doesn’t dry out. 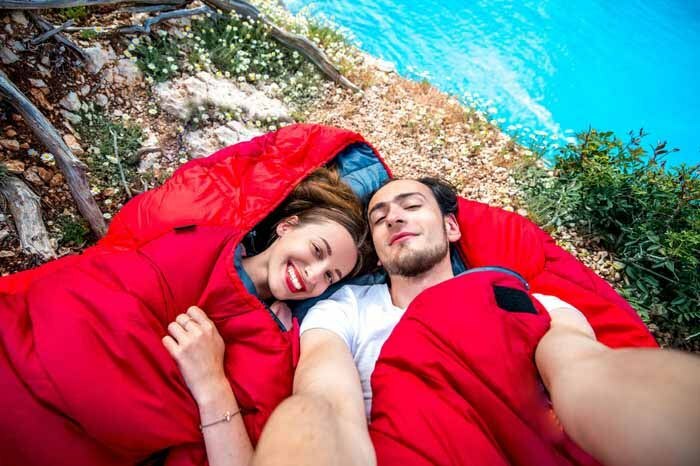 We highly recommend this sleeping bag for two people; unfortunately, it doesn’t really compress into a very small size and carrying it along will be quite tricky. 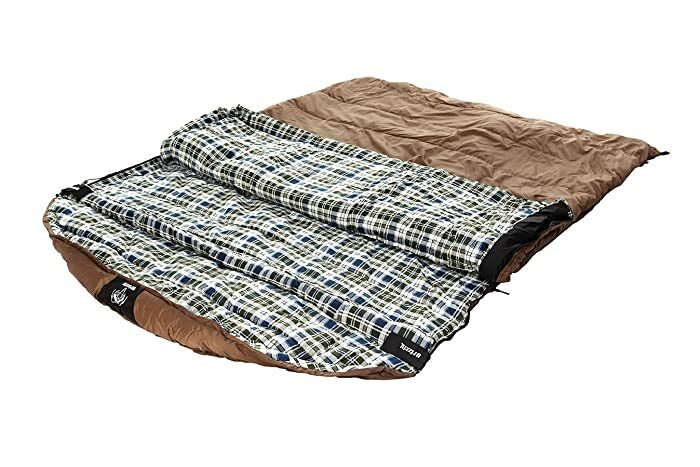 The price is also really affordable when compared to the best synthetic sleeping bags and it will be ideal for camping. 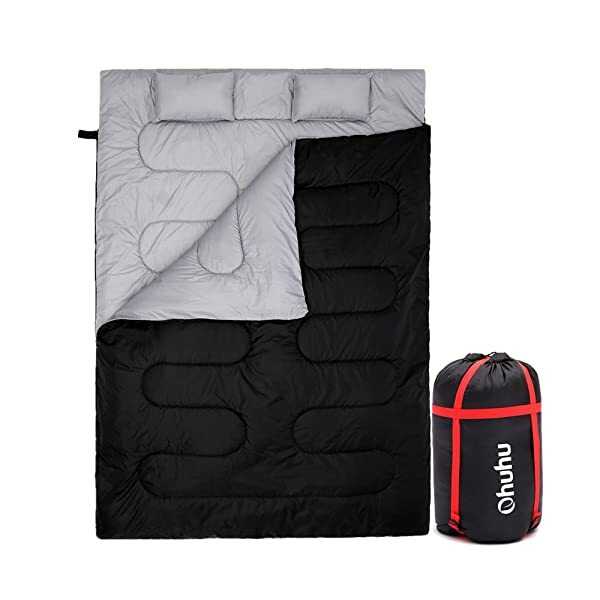 The Ohuhu double sleeping bag is also a great option for those looking to invest in a cheaper sleeping bag with decent additions. The sleeping bag comes with 2 pillows included and the filling is made from cotton to keep you relatively warm in colder temperatures. One of the main benefits of having this sleeping bag is the multifunctional use it offers. The sleeping bag can be separated into two separate sleeping bags if needed. The sleeping bag is also not that heavy and once the two sides have been joined together. The sleeping bag will have a size of 86.6 x 59 inches, which will be slightly larger than that of queen sized bed. Besides, the sleeping bag is quite heavy and weighs in at 7.6lbs, but it will keep you warm in temperatures of 23 degrees Fahrenheit. It is quite heavy and will make life harder if it needs to be carried for miles on end. We highly recommend the sleeping bag for the cheaper price and we believe that you will get great value for your money. The brand is also not that well-known and giving it a try can certainly save you a few bucks in the long run. Since buying the best double sleeping bag for backpacking or camping is so tricky, we hope that you have found this list to be helpful in some way. Buying a good sleeping bag is always considered to be an investment and we believe that these will keep you satisfied on your outdoor trips. 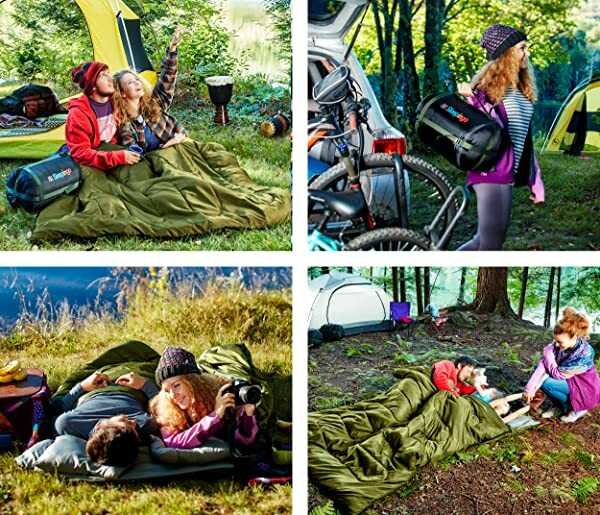 We highly recommend the Double Sleeping Bag Queen Size XL! - Sleepingo for the great design and affordability. This might not be a budget sleeping bag and you can find much cheaper, but this one will keep you warm in colder conditions.